Here’s a picture that was taken earlier today (click on it to see it larger). It may look like any panel van that one would see making deliveries around the city. On the back window is something you may also see around the city considering that the nation is entering the final stretch of the presidential campaign. But take a look at the logo on the front passenger door. Diebold. Yes, Diebold. I realize that its difficult to see, but that’s the logo of the company that makes the voting machines for Ohio. 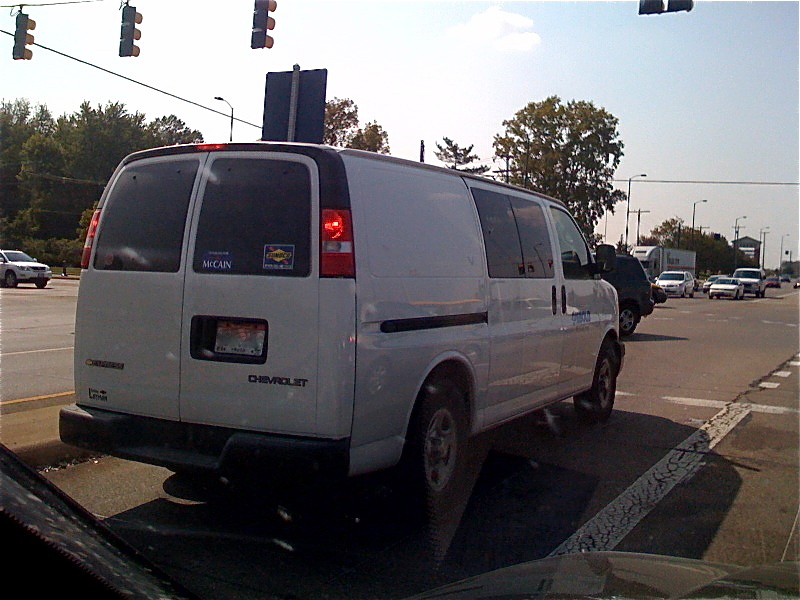 Might it be just a bit of a conflict for a Diebold van to be promoting a specific presidential candidate? Answer: YES. Have a look at Diebold’s web site for a better view of their logo. Premier Election Solutions focuses on two priorities when delivering election solutions: the voter and you — the person responsible for making sure the election process runs accurately. We’ve developed a process that ensures your needs and the voting public’s needs are anticipated and met well before the first ballot is marked, and after the last one is counted. “…anticipated and met well before the first ballot is marked…” now that’s really funny. While its never too late to start, Columbus should prepare for this in 2009. The greater Helsinki metro area dropped transit fares by 50% to €1 today in observance of the day, as stated in this article. I’ll be on the bus today, as well. The power is on and in an instant, I’m back in the swing of things. The blackout was a good excuse to clean out the refrigerator – that salad dressing had been in there for a long time anyway. Best to get a fresh start. Without power I had nothing better to do than to get out of the house more than I usually do. I ran into a previous neighbor while having dinner at Gresso’s one evening. I hadn’t seen him in nearly three years. When I ventured to White Castle for my morning coffee I learned from the young man there that his mother had decided to brew coffee on the grill, using fallen tree limbs as fuel. I learned how to load cash onto a pre-paid card at the laundromat. Best of all, I received four years of bank statements from my bank in Finland. I’d set up the account there in 1996 when I was having trouble using my ATM card for retrieving cash from my US account. A local account meant no conversion fees. In 1998 while I was working there, the dollar soared in value and I made weekly deposits, realizing that it was likely a temporary situation. In doing so, I was essentially funding future visits. When I began writing the book Hakaniemi, I thought it would be a good idea to gain some exposure in Finland in preparation for it’s publishing. I searched the Net for weeks looking for some sort of Finnish writing competition. Considering that Finland has one of the highest rates of book buying per capita, I figured that they must have some creative outlet for supplying the market. I found nothing applicable. During the winter of 2007 I received a call from my friend Maria who lives in Helsinki. She and I had met at a concert given by a dynamic pop-choir known as Semmarit. Knowing my long-standing love for their music, she told me that the group was hosting a writing competition for their fans. In 2500 words or less, one had to describe their most memorable interaction with the choir. This, I determined, was predestined. I’ve been following the choir for more than ten years, have all of their CD’s and had flown over three times to see them live. I can win this one. I whittled down the story to exactly 2500 words. It didn’t have to be a mark of literary brilliance – it simply had to be something unique. I submitted the story. When the e-mail address I used made its way to a spam list, I disabled it not realizing that I also cut off my line of communication with the choir. Months later Maria called again, saying that she noticed that I had placed in the top five of the competition. She saw my name listed on their web site. Apparently I had also sent in the access codes to my bank account because when the bank statements arrived this week I saw that I had won €100 from the choir and they had deposited the money earlier in the year. Its not much, of course, but it does represent a great milestone. It represents how little things that take place in the history of our lives can blossom into something unique and memorable even years later. In yet another unique twist, it wasn’t but a month or so ago when a friend and I contemplated starting a small company and jokingly said that we should require payment in euros. “Stable currency for stable thoughts” would be how we’d explain it. The winning submission is below. The full story of this encounter is in one of the chapters of Hakaniemi and is the very reason that I have my long-standing friendship with Maria. Today I added a bit about her on the book’s web site. Having arrived from the US feeling a bit ill, I rested for a day on the sofa at a friends house in Lapua. She sorted through her music collection, setting aside Kuka on Tuo Mies and Ruohonjuuritasolla. “I think you’ll like these guys” she told me, as she hurried off to work. After a nap, and having learned how her stereo worked, I put in the CD’s and went back to the sofa. While I didn’t understand the words, the clear voices and up-beat rhythms caught my attention, and soon, I found myself sitting with the lyrics, trying to follow along. Over and over, I listened to the songs, then unpacked my dictionary and began translating them, as best I could. Sheets of paper lined the floor, creating a bit of a mess by the time my friend returned from work. “They’re from “Jyväskylä”, she told me. “A group of school teachers that started signing together. They’ve become quite popular”. “The grandparents of my prom date lived there. Let’s see if the guys performing while I’m here and we’ll go see them”. Nothing was scheduled. Before catching the train to Helsinki, I bought the two CD’s. On the flight home I listened and studied the words, finding myself more delighted with their sound. When I returned to Lapua the next year Sampo Texas had been released. “I’ve got to see these guys”, I told my friend. As it happened, there was a concert planned in Helsinki, just two days before I’d leave Finland. “I’m going, That’s all there is to it” I thought to myself, and I made the necessary arrangements. I left Lapua, excusing my early departure for the sake of gaining a cultural experience. At the concert I met a young woman and spent most of the evening chatting with her in English. As the concert began, we moved towards the stage, clapping and moving to the music. Singing along with the songs that I knew, I noticed that Maria was watching me, rather than the choir. “What the hell are you doing?”, she asked. “Not always, but I do know the words”. She burst out laughing hysterically. From that moment on, we’ve been best of friends. I flew back a few months later to see Semmarit perform in Seinäjoki, and again in late 1997, I attended another Helsinki concert of my favorite choir. Now in Ohio, Semmarit rides along in my car, and I sing along to all of their CD’s, recalling the look on Maria’s face during my first encounter with them. Heeding the state’s call to help transit authorities, the Mid-Ohio Regional Planning Commission is allocating $2.1 million to COTA. Read the full article in today’s Columbus Dispatch. Here’s an example of how public transportation plays an important roll in making Columbus a more livable city. Besides the admission savings, they’ll be no need to pay for parking in an already congested area. Click here for more information. In a non-tangent to public transportation, but related to the importance of the arts, read one Columbus resident’s view on why he feels such a personal connection to the Warhol exhibit. The two posts are at Columbus Underground by Zachery Allan Starkey. Last week I decided that I needed to go for a train ride. I hadn’t been on a train for years and I’ve never been on the American rails, so I popped onto Amtrak’s site to have a look. That’s when I discovered that I could arrive in and depart from Chicago on the same day and have thirteen hours to explore the city – a city I hadn’t been to in a very long time. Four days prior to departure I secured round-trip passage for $166. On Friday night I headed for Cleveland to catch a 2:47 am Saturday departure. I decided to drive because parking at the terminal is free and had I taken the bus, I would have had to pay for cab fare to the station. I figured that a half tank of gas would be about the same as cab fare, and it gave me some added flexibility. Cleveland’s terminal is small – odd for a once prominent city, but the space was clean and surprisingly filled with others waiting for one of two Chicago-bound trains. Despite a thirty-minute delay the staff was helpful and communicative about the late departure. Boarding of the train was easy. We crossed the tracks and were escorted to our respective car by a well dressed and pleasant crew. Onboard, I was surprised by the amount of personal space and cleanliness of the Amtrak Superliner. My coach seat rivaled any First Class airline seat. My seat reclined nicely and with the leg rest and foot rest extended I had plenty of comfort for the 6.5 hour ride. On board, attendants took care of information personally so that those who were sleeping wouldn’t be awakened by public announcements. On the lower level of each coach car were three bathrooms and a large dressing room which was equipped with a nicely upholstered stool and large mirrored vanity. Every seat had access to electrical outlets. When I lived in Salt Lake I lived a block from the rail line which led, not only to the Amtrak station but to a large rail yard, both just a few blocks in either direction. Once I got used to the sound of passing trains and the unique horn-blowing patterns of various engineers, I found that the heavy sounds of steel cars rolling past were actually restful. From inside the Superliner the deep, distant muffled sounds of engine and horn blowing at grade crossings reminded me of that. I dozed off along the way while watching the small American Gothic-like towns pass by. Toledo’s train station came as a surprise – as an icon from another time. Multiple platforms were covered by large arcs of iron framework and drop lights gave the nearly abandoned place the look of an Edward Hopper painting. Heavy shadows against equally heavy iron and stone. Daylight broke before we reached South Bend. I knew I’d sleep no more as the landscape became visible so I made my way to the lounge car to get a coffee. Downstairs a small cafe offered packaged treats and drinks. Above it was the beautifully appointed observation deck with larger windows, arcing glass ceilings and overstuffed chairs set up for viewing. Passengers met there to chat and watch the countryside move past. A formal dining car was also available, complete with reservations and after 7 am, announcements were made when one’s table was ready. The inter-state freeway system has moved commercialism away from the tracks, but has left behind the traditional agricultural interests of mid-west, leaving the view unencumbered by modernism. I sat upstairs for a bit and watched the golden morning light weave its way through soon to be harvested crops. Telegraph lines still hang from leaning weathered poles. Flourishing agriculture gives way to an eerily vacant Gary, Indiana. Soaring, vast and expansive facilities rust away as far as the eye can see. Strange and mutated land where it would be difficult to imagine anything could grow again. Chicago’s Union Station greeted me at 9:30 am. Up to the street I found the city already awake. Spotless! Downtown Chicago is spotless. First stop was the Chicago Architecture Foundation to get tickets for their river tour. A ninety-minute tour for $30. They sell out quickly on the weekends. Breakfast at the corner of Wacker Drive and Wabash with the Marina Towers watching over me. A stroll along Michigan Avenue with a friend from Columbus who happened to be there for a wedding. The afternoon, including the river tour, was spent with a friend who is in Chicago for her Master’s in architecture. Deep dish pizza for dinner. We’d planned to visit one of the museums, but found that they were closed by 5 pm, so we walked along the lake, stopped for an ice cream and spent time at Millennium Park – part of the 24-acre Grant Park which abounds with interactive public features, including the new outdoor concert venue by architect Frank Gehry. Hundreds upon hundreds of people were out enjoying the space in picture-perfect weather. A truly magnificent city. I arrived back at Union Station with time to spare. Its grand hall soars to coffered ceilings atop fluted columns. The platforms are now below grade, as the city purchased the air rights from the railroad and built over them. Boarding the train back to Cleveland was efficient, and Amtrak offers pre-boarding to the elderly and families first. A standard train for the ride home was equally spacious. Greeted once again by a friendly staff and escorted to our appropriate car, we were individually offered fresh pillows after our tickets were inspected. I slept the entire way home, exhausted from a wonderful day in the city. Amtrak was better than I ever expected and while not as fast as the trains in Europe, the quality of the ride was equal, if not better. Compared to airline travel, it is far superior. Downtown to downtown travel requires no additional cost in transportation and when Amtrak returns to Columbus, I’ll be hard-pressed to want to return to the long lines, intrusive security and hoards of angry people that the airlines have created. If there is to be another golden age of American travel, it most certainly will include trains. My total expenditure for the trip was $281, including the gas to drive to and from Cleveland. A great price that included the great journey. Photos from the visit are on Flickr – up and to the right.